Time is on our side. Yes, it is. As any Republican voter will tell you, the national popular vote doesn't matter, and they're right – to a point. As I've written previously, whether it's the House, Senate, or Presidency, Dems need somewhere between 52 and 55% of the votes cast to reliably win a control of any of those bodies (and that's above and beyond the voter suppression aimed squarely at minorities, the poor, and young people). The rules of the game are outrageously tilted, but as the special elections have indicated, even that can be overcome if the intensity of the liberal voters is strong enough. How much do we gain from the simple passage of time? Children are our future (and non-sarcastically, those Parkland student activists really are amazing) and they are way more progressive than their older counterparts. As they slowly replace us, how does that change the electoral landscape, cycle by cycle? While lots of articles have been written about Trump Regrets there are quite a few others claiming that Trumpsters, and Republicans generally, are sticking to their (literal) guns. Just to keep things simple, for most of this exercise, I'm going to assume that nobody changes their mind about anything. They simply get old enough to vote, or eventually drop dead. I'm doing what's called (in astronomer lingo) "passive evolution." Adapted from the U.S. Census Bureau. A couple of quick notes: a) The Census Bureau only includes binary genders and presumably uses those assigned at birth. b) (And this was a surprise to me), apparently there are more baby boys than girls. Young people are liberal (100% dem voters). Older people are more conservative (100% republican voters). 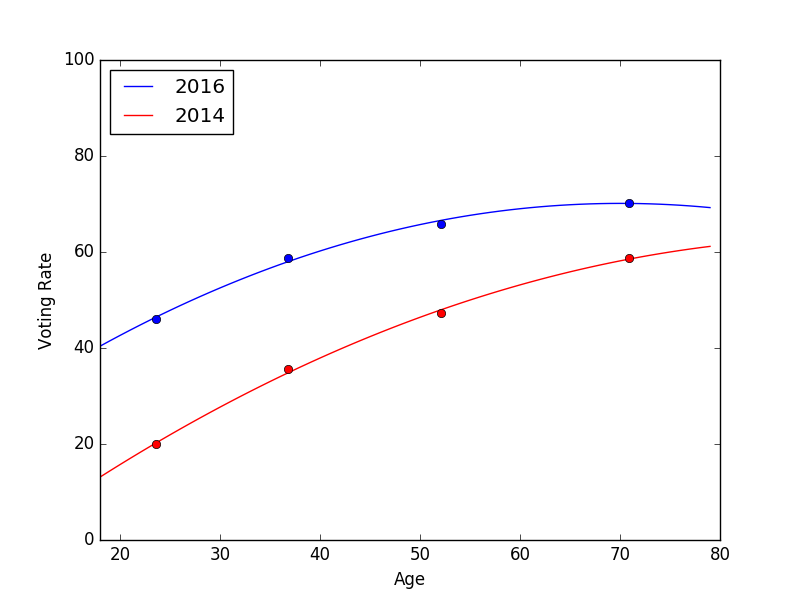 Young and old vote in equal proportions. An individual's political preference is fixed in time. The population overall is flat and there is no net immigration/emigration. 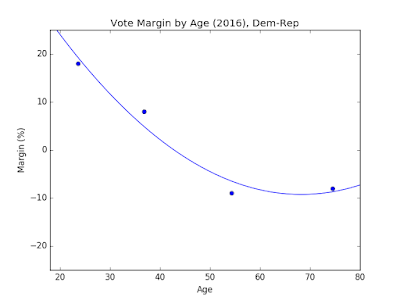 If annually, 17 year olds (about 3.5% of the adult population) replace older, more conservative voters, then the model would find that the Democratic would increase by 3.5%/year (7% by the time midterms come around) through "passive evolution" alone. 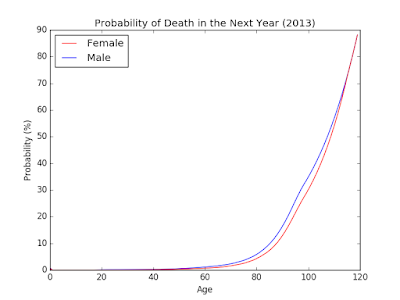 A couple of random facts: Did you know that a 71 year old man has a 2.6% probability of dying in the next year? 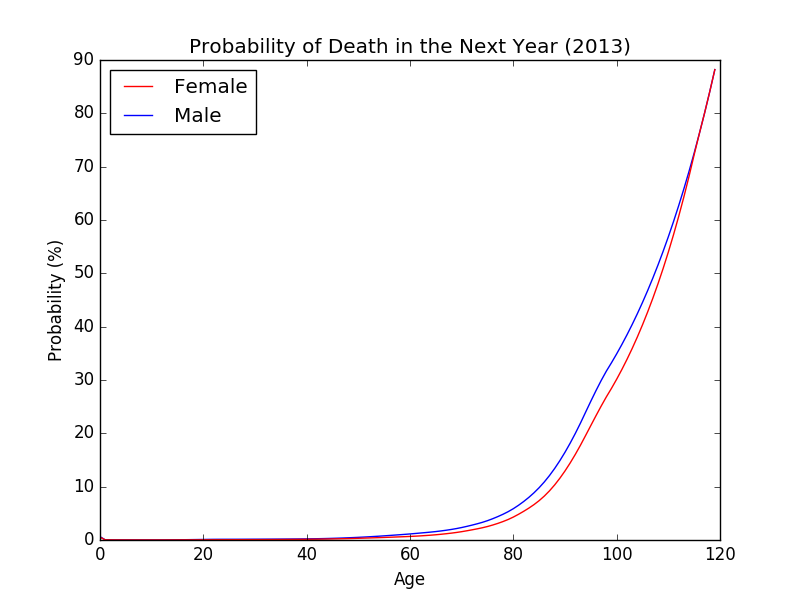 Also, that if you're a man, at age 39, you have as much expected life ahead of you as behind. For a woman, it's 41. 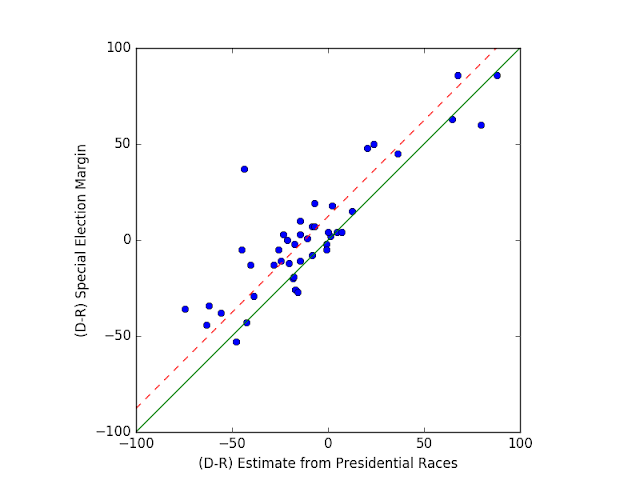 The points show the binned data as reported by the Election Project, as compared with my extrapolated model. It should be clear by inspection that there's a reason that most people assume that Republicans do better in midterms. Young people (at least historically) do a bad job turning out, even compared to their regular low turnout rate. For what it's worth, the exit polling also breaks out the sub-population of 18-24, and claims a 21% margin. My model finds 23%, so not perfect, but pretty close. Due to roundoff in the modeling and inaccuracies in exit polling, this result only gives Hillary a 0.3% victory, as opposed to the actual 2.1% that she won by. Still, the whole point is to figure out how things change if we simply allow kids to start voting and others to pass on the mortal coil. In this scenario, about 1.4 million men die per year, and about 1.3 million women die – about 1.9 million 2016 voters in total. 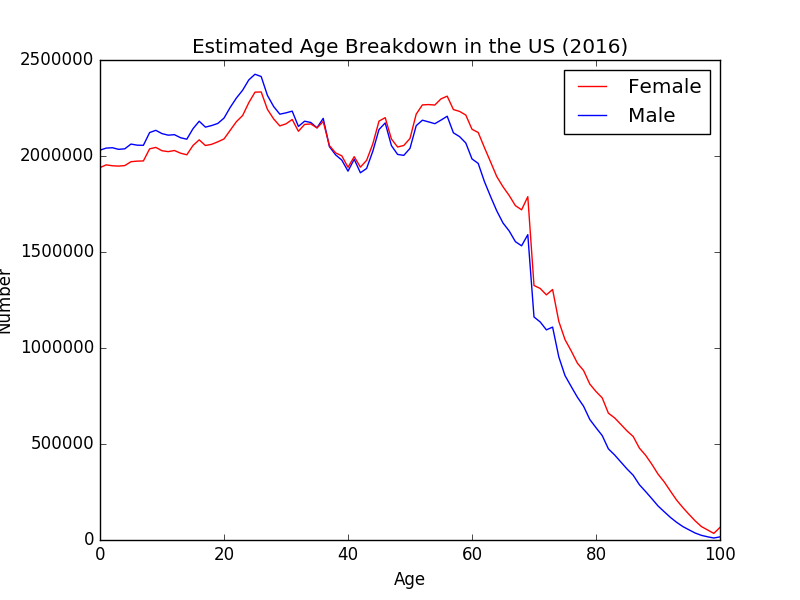 Based on demographics, this means a net loss of 98,000 Trump voters (in excess of Clinton voters) per year. Meanwhile a total of 4.2 million people turn 18 producing (even with the lower turnout), a net of an additional 467,000 democratic votes, again, per year. That improves the democratic national margin by about 0.4%/year, or about +0.8% for the 2018 election (and thus about +1.6% nationally by 2020, which one of the many reasons that I'm not terribly concerned about Trump winning reelection). I should note that when people talk about Trump regrets and such, they almost never include the fact that the same people aren't voting now (or in 4 years) as voted in 2016. This is the pessimistic scenario because it assumes that young people simply don't vote. In that scenario, the Dem margin changes, by -1.4%. That's worse than in 2016. This is, of course, why many pollsters can get away with "likely voter models" that favor the Republicans by several points compared to "registered voters." I have a feeling, however, that this year is different. And at any rate, this model is only relevant in the midterms. 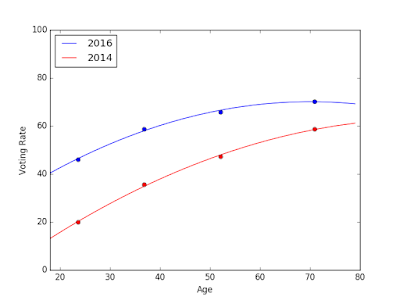 Nobody changes their mind, but all ages vote with equal likelihood. This scenario is great! Again, even without changing opinions, Democrats improve their national margin by +2.6%. And again, this is above and beyond Democrats outperforming in terms of turnout within a demographic. Enthusiasm and a general move to the left have changed things significantly since November 2016. In the past, the working assumption would be that Dems are in trouble during the midterms because we normally stink at getting out the vote (see scenario #2). But every indication, from protests to generic ballots to the specials have suggested that the needle has moved by 10-20(!) points compared to 2016 and/or past elections. It's entirely possible that we're experiencing a see change. Do people become more conservative with time? This is a toughie, in large part because the policies corresponding to "liberal" and "conservative" have changed with time. One study in the U.K. suggests that the effect corresponds to about 0.3%/year – on par, but smaller, than the other effects of deaths and new young voters. The folks at 538 find that it's not quite so simple. They find that it really does matter who was president when you were 18 and how they did. Unsurprisingly, the most Democratic groups are those who were 18 when Kennedy was president – and even more, when Bush II was. One can assume that 18 year olds now will be Dems 4 Life. Will the Millenials eventually start to vote? 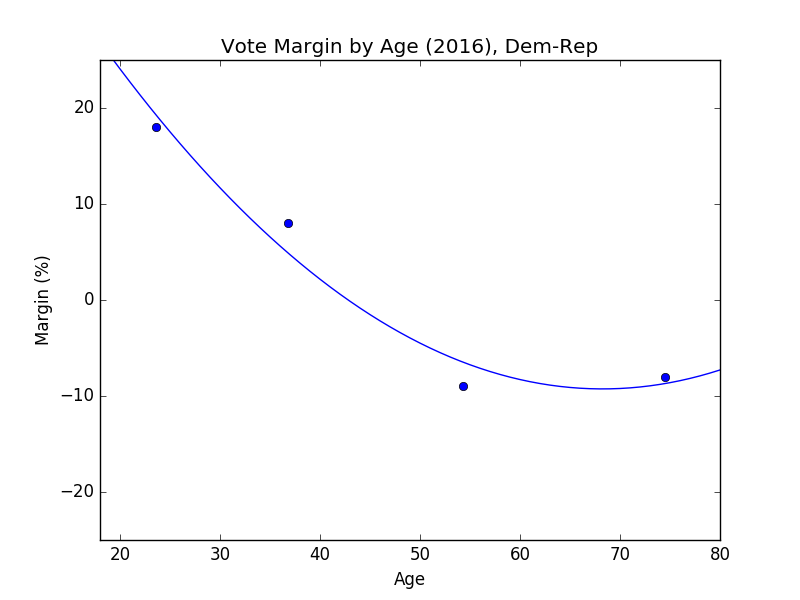 If you look at my 3rd plot, above, election year voting goes from around 40% at age 20 to 60% at age 40, about a percent a year. 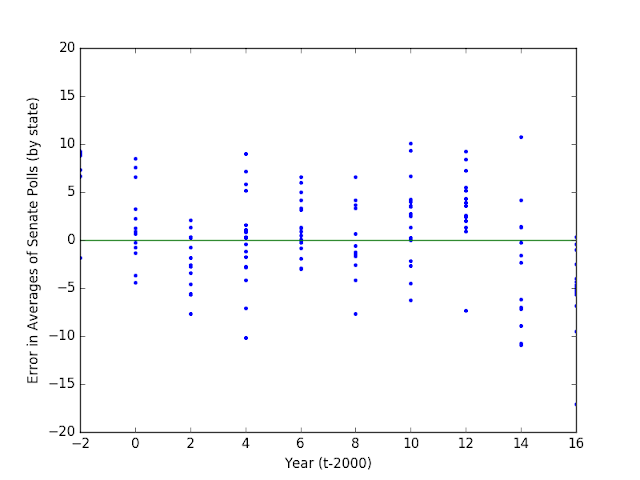 Does that mean that a particular cohort votes more and more frequently as they get older and get more mature? About 35% of young people (18-29) voted in 1988. That same group was in the 30-44 cohort 12 years later in the 2000 election. In that election, they voted at about 50%, a bit over a per cent a year. For what it's worth, this results in a Democratic improvement of about 0.3% per 2 year election cycle. That's in addition to my 3 passive models above. The race gap is huge, but as with younger voters, minority voters turnout is significantly lower than white folks in all years (by design of the Republican party). Non-hispanic white people account for about 73.6% of the 2016 voters but in 2016, they were about 61.1% of the population. In 2014 (mid-terms), they were 76.3% of the vote. 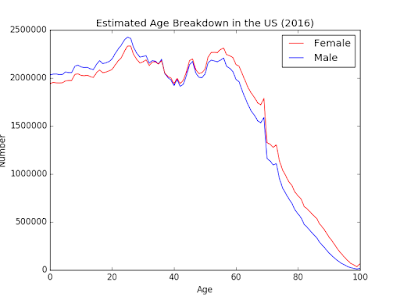 There's some overlap between young voters and minority voters, of course, but as time goes on, there are some huge changes with regards to demographics. This is part of why white resentment was able to be stoked during the Trump era. Consider that in 1996, 73.2% of the electorate was white non-hispanic, down 12.1% in 2 decades, with most of that share (10.6% -> 17.8%) going to growth in the Hispanic population. This, too, points to an overall shift of about 0.3%/year or a little over 1% per presidential cycle. or about 0.6%/year or a net gain of about 2.4%/election cycle. For what it's worth (and recognizing that national averages don't get spread out uniformly), those passive trends – and nothing else – would have given Hillary Michigan, Wisconsin, Pennsylvania and Florida, a total of 75 electoral votes. They would have also reversed the 2016 Senate results in Missouri, Pennsylvania, and (if you squint), Wisconsin. Stick with it, folks. Time is not on their side.